50 THE SHOP APRIL 2019 W hen Christa Harden began installing vinyl signage and vehicle wraps, she was working as a graphic designer at Battle Ground Printing in Vancouver, Wash- ington. While employee turnover nudged her to become involved in the print shop's production and installation processes, the skills Harden acquired would eventually lead her down a path she never anticipated. LOVE AT FIRST SIGN At Battle Ground Printing, she met and fell in love with Mikalae "Mik" Harden, who started the business with his father at age 19 and helped grow the modest print shop into a one-stop marketing business. The couple married in 2011 and hoped to focus their abilities on one service by establishing their own independent vinyl- graphics installation business in 2015: MXC Media (the "M" and "C" in the name represent the first letters of their names). "We both liked the idea of install- only to just focus on one niche you could really do your best at rather than trying to be the best at every- thing, which is very difficult to do," says Christa Harden about her and Mik's decision to branch off from the hectic print shop. 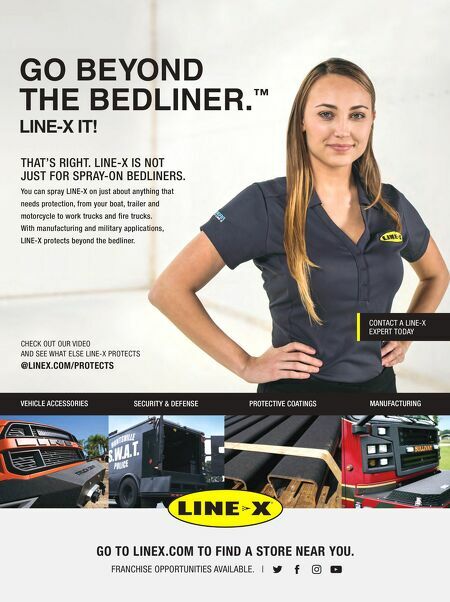 Mik Harden, armed with Profes- sional Decal Application Alliance (PDAA) Master's Certified Installer and 3M Preferred Installer designa- tions, worked as MXC Media's lead installer and Christa worked as an installer and project manager. The duo provided mobile services in Oregon and Washington. CONTINUING A LEGACY On July 31, 2018, Mik passed away after a tragic motorcycle accident, leaving the growing business without the vital cer- tifications to continue the services the 50 THE SHOP APRIL 2019 Carrying By Patricia Kaowthumrong How a mobile graphics installer is honoring the memory of her beloved husband & blazing a trail for other female installers. On Christa Harden has worked to earn graphics installation certifications in order to carry on the work of MXC Media after her husband and business partner Mik died in a motorcycle accident last year.